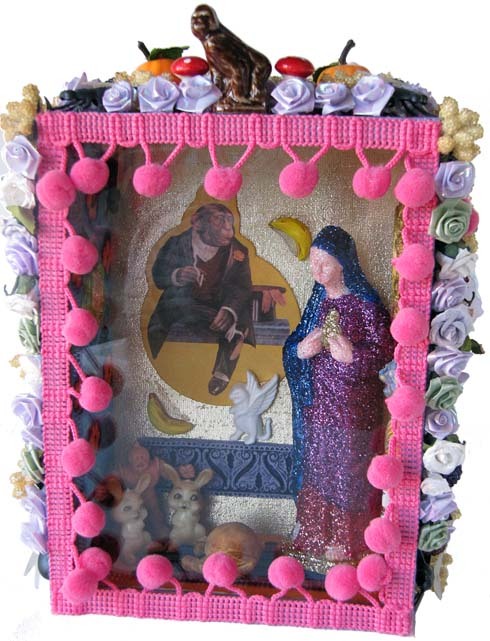 An homage to Peruvian retablos, featuring a glitter-covered Virgin Mary nightlight and a Monkey Fresh air freshener from Archie McPhee. The sides of the box are lovingly festooned with fake flowers, toadstools, plastic flies, and hideous little plastic babies. The gorilla atop the box is a reference to The Thinker atop Rodin's Gates of Hell.